Seattle artist Carolyn Dunford moves between two very different worlds in her work: the abstract and the concrete. 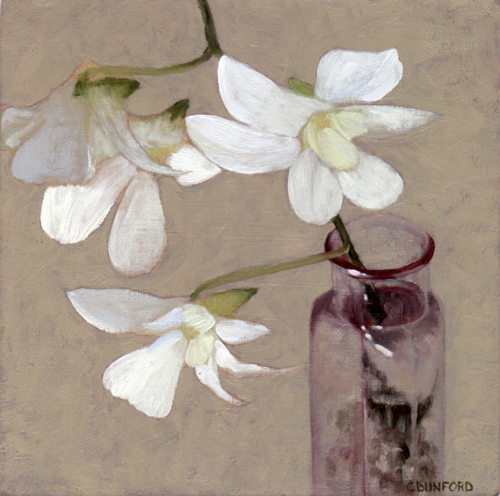 She is equally known for her pattern based encaustic abstract paintings as for her representational still-life work, the latter of which we have in the gallery. Even though these works are grounded in the real, her other world still manages to creep in, "The subject of these paintings is flowers, but as I painted them, my focus shifted to the more abstract aspects of the subject, color and design. 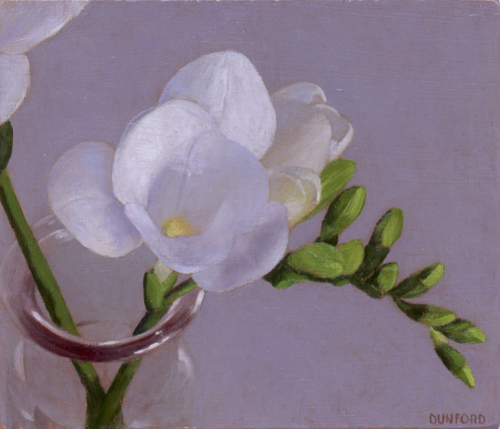 At some point each painting became less about flowers and glass and more about my fascination with the subtleties of color and light in the flowers and glass," say Carolyn. She paints using multiple layers of transparent and semi-transparent glazes, which allow her to manipulate the subject matter, enhancing some aspects and making others recede.